Why take our word for it... all hail the King of Fruits. King of all fruits of earth! "Westerners do not generally become excited by the durian and this may be due to not knowing how to select or eat this wonderful fruit. It doesn't help that Western descriptions of the fruit usually mitigate against the formation of favorable reception. It is a pity that the authors of travel guide books are not more fair-minded about the durian. Their descriptions are extremely negative and frequently use scatological terms in reference to the durian. Hundreds of thousands of Asian people do not see it that way at all and find such comparisons insulting. Fine durians are so extraordinarily delicious that it seems hard to understand that anyone could disparage them. The great naturalist, Alfred Russell Wallace, who spent eight years researching the flora and fauna of the Malay archipelago in the late 1800’s wrote that ‘eating durians is a new sensation, worth a voyage to the East to experience’—and this was written at a time when eastern journeys involved long tedious sea passages and untold difficulties and hardships. Because of the inherent limitations of words, it is impossible to adequately describe the taste of the durian. It is highly reminiscent of custard or cake and after eating one of them one feels a sort of glow and a sense of euphoria, an inner satiety. (...) Not only does durian bring in a significant income, it is greatly relished in one form or another by almost every Bidayuh [ed. note: a tribal people of Borneo]. 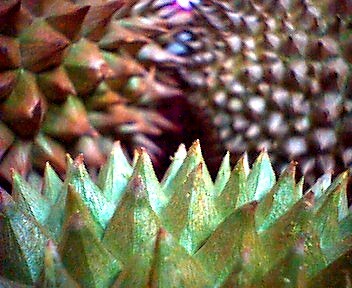 It is interesting to note that no one regards durian in a negative light; the Bidayuh are extremely fond of this fruit. It is virtually unheard of for a child to dislike durian. All the children, even the youngest, eat it with abandon. If it truly was such a loathsome and ‘smelly’ item as so many Westerners decree, how could there be such unanimity and avid enjoyment of it among children? They simply take to it naturally and instinctively because it is genuinely wholesome and agreeable. The Bidayuh do not regard the smell as repulsive and heaps of durian are kept right inside the living quarters. The only time that they are really cognizant of the aroma is when they are out collecting. They have an uncanny ability of finding durians which have dropped into dense undergrowth and can't be seen. From the aroma alone they are able to detect hidden durians and they can find and follow a durian scent much in the manner of bloodhounds. How may one view or interpret this aroma? Is it merely something incidental? It must fit in somewhere. Perhaps this aroma is a sort of 'calling card' or a kind of advertisement. Nature has endowed durian with a wonderful and unmistakable aroma to insure that it will be noticed. This arousing aroma seems calculated to invite animals to come closer and investigate the offer, the reward being a highly delectable and memorable repast. Of course there is a bit of a ruse at work. The wide dispersal of the seeds is fundamentally what the tree must achieve. Durio zibethinus has perhaps gone further and put more into its reliance on animals to assist in the dissemination of its kind. It has developed a huge fruit with a very nutritious aril and enclosed that in an almost impregnable housing which provides sufficient protection for the seeds until their maturation. Once that state is reached this attractive odor is broadcast announcing the presence and the readiness of the flesh. The outer skin which once was so invincible is now opening all by itself. It doesn't require much reflection to see that this is an artfully ingenious design." from "Durian of Kuching, Part 2"
"The banks of the Sarawak River are everywhere covered with fruit trees, which supply the Dyaks with a great deal of their food. The Mangosteen, Langsat, Rambutan, Jack, Jambou, and Blimbing, are all abundant; but most abundant and most esteemed is the Durian, a fruit about which very little is known in England, but which both by natives and Europeans in the Malay Archipelago is reckoned superior to all others. When brought into a house the smell is often so offensive that some persons can never bear to taste it. This was my own case when I first tried it in Malacca, but in Borneo I found a ripe fruit on the ground, and, eating it out of doors, I at once became a confirmed Durian eater. The Durian grows on a large and lofty forest tree, somewhat resembling an elm in its general character, but with a more smooth and scaly bark. The fruit is round or slightly oval, about the size of a large coconut, of a green color, and covered all over with short stout spines, the base of which touch each other, and are consequently somewhat hexagonal, while the points are very strong and sharp. It is so completely armed, that if the stalk is broken off it is a difficult matter to lift one from the ground. The outer rind is so thick and tough, that from whatever height it may fall it is never broken. From the base to the apex five very faint lines may be divided with a heavy knife and a strong hand. The five cells are satiny white within, and are each filled with an oval mass of cream-colored pulp, embedded in which are two or three seeds about the size of chestnuts. This pulp is the edible part, and its consistence and flavor are indescribable. A rich butter-like custard highly flavored with almonds gives the best general idea of it, but intermingled with it come wafts of flavor that call to mind cream-cheese, onion-sauce, brown sherry, and other incongruities. Then there is a rich glutinous smoothness in the pulp which nothing else possesses, but which adds to its delicacy. It is neither acid, nor sweet, nor juicy, yet one feels the want of none of these qualities, for it is perfect as it is. In fact to eat Durians is a new sensation, worth a voyage to the East to experience. When the fruit is ripe it falls of itself, and the only way to eat Durians in perfection is to get them as they fall; and the smell is then less overpowering. When unripe, it makes a very good vegetable if cooked, and it is also eaten by the Dyaks raw. In a good season large quantities are preserved salted, in jars and bamboos, and kept the year round, when it acquires a most disgusting odor to Europeans but the Dyaks appreciate it highly as a relish with their rice. There are in the forest two varieties of wild Durians with much smaller fruits, one of them orange-colored inside; and these are probably the origin of the large and fine Durians, which are never found wild. It would not, perhaps, be correct to say that the Durian is the best of all fruits, because it cannot supply the place of the subacid, juicy kinds, such as the orange, grape, mango, and mangosteen, whose refreshing and cooling qualities are so wholesome and grateful; but as producing a food of the most exquisite flavor it is unsurpassed. If I had to fix on two only, as representing the perfection of the two classes, I should certainly choose the Durian and the Orange as the king and queen of fruits." (The Treasury of Botany, Vol. 1). after a fruit-eating bat has pee'd on it." he didn't know what he was missing!